Wounded Giant brings long hair and louder guitars to town next week. Jack Endino is a legend. He's a man with many accomplishments on his résumé, but he'd earn that status for no other reason than he famously recorded Nirvana's debut album Bleach for $600. That's true around the world. It's especially true in Seattle. 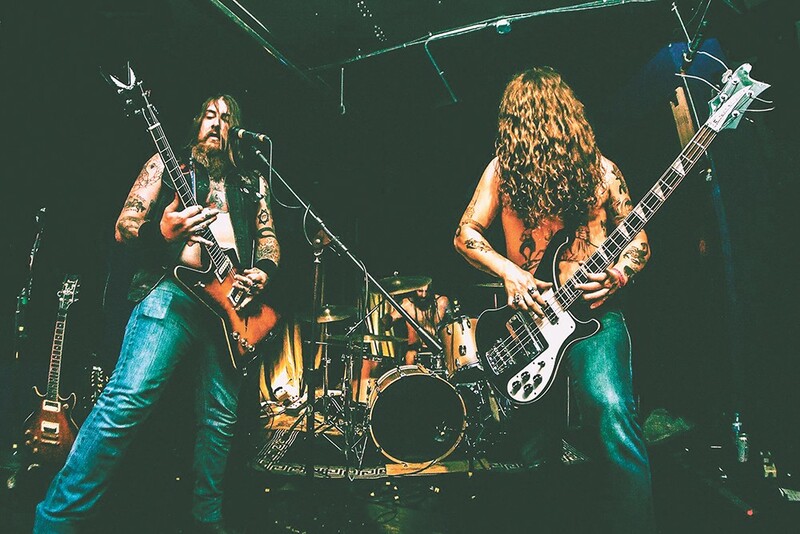 So when Seattle heavy metal trio Wounded Giant had the opportunity to record its sophomore full-length with respected Portland-based producer Billy Anderson, they couldn't say no. But before they could say yes, there was one thing they had to do. "Jack's great. I've worked with Jack a lot. He mixed and mastered [our first album] Lightning Medicine," says Wounded Giant vocalist and guitarist Bobby James. "I actually asked his permission before we went with Billy." Endino gave the union his blessing, and the payoff can be found all over Vae Victis, the outstanding new Wounded Giant album released earlier this year by STB Records. At once hulking and airy, Vae Victis (translation from Latin: "woe to the defeated") is a sizable step forward from Lightning Medicine, moving the band from standard-issue, heavy-footed stoner/sludge act to forward-looking metal explorers with a vision beyond thudding riffs. Not that Vae Victis isn't heavy, mind you. It is. But heaviness is the foundation upon which Wounded Giant stacks memorable melodies, psychedelic sounds, weird spoken-word clips and more. It's noticeably more ambitious than the band's previous work. "When we recorded the first record, to be honest, we were so high that we played everything a little slower than we usually do," James says with a laugh. "I hear it now, and I'm like, 'Oh wow, I don't remember playing this stuff that slow.'" Of course, Wounded Giant made Lightning Medicine nearly four years ago, when they were a younger, less experienced band. For Vae Victis, they worked harder on the songs, did more prep for the studio, and then spent more time layering on sounds. The presence of Anderson – best known for his work with bands like Sleep, Jawbreaker and Pallbearer – was key, too, James says. "Billy is kind of a Jackson Pollock kind of guy. He'll throw paint around and we'll just see what happens," he says. "If we have an idea, he'll chase it." Regardless of the album's sonic qualities, it grew out of a "darker, more pissed-off" place, James says. Lyrically, it uses a character — an insane charismatic cult leader — to explore themes of cynicism, faith, freedom, conformity and the grey areas in between. An instrumental interlude, "Immanentize the Eschaton," features samples of famed Peoples Temple leader Jim Jones proselytizing. In the rumbling "Scum of the Earth," James chants "Nothing is true / Everything is real / Everything is true / Nothing is real." But in "Dystheist," that agnosticism has given way to a bleaker view: "All hail nothing! All hail no one!" James sings atop a caustic churn of electric guitar and thunderous drums. The contrast between Wounded Giant's slightly more accessible sound and its roots in personal misery are not lost on James. "We were like, 'We're gonna make a pissed-off record and try to get a little catharsis out of this,'" he says. "We were trying to get out some negative energy, so I don't know — maybe we're pretty when we're mad." Now, Wounded Giant is back out on the road for the first time in two years, and James is loving every minute in the van with drummer Alex Bytnar and bassist Mark Haber. The time off happened for several reasons: day jobs, making a new record, a new baby, and James having recently moved with his family to Luxembourg.